Washington, D.C. — Despite unrelenting competition and flat rates, most insurers providing architects and engineers (A/E) professional liability insurance achieved significant premium growth last year. A new survey by insurance broker Ames & Gough finds increased policy count, A/E firm revenue growth, heightened risks, and wider purchases of increased insurance limits, all contributed to these favorable results. As they look to grow or maintain their books of business in 2019, the majority (67 percent) of insurers in the Ames & Gough survey of 18 leading insurance companies (which, on a combined basis, represent a significant percentage of the overall marketplace providing professional liability insurance to architects and engineers in the U.S.), plan no change in rates. Of the remaining insurers, four will seek rate hikes of up to 5 percent and two insurers, from 6 to 10 percent. “For the most part, rather than to seek across-the-board rate hikes, insurers planning to raise rates this year are zeroing in on firms with higher risk disciplines and project types, or those operating in geographic areas with greater claims activity,” said Joan DeLorey, senior vice president and partner, Ames & Gough, a co-author of the survey. 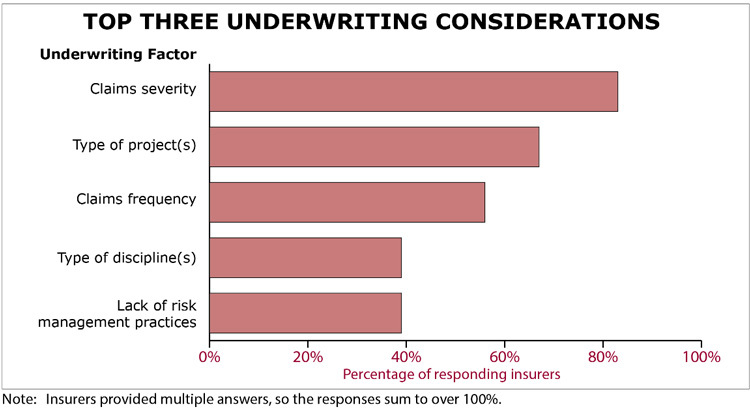 Although insurers consider several factors in underwriting a particular risk, they generally appear most concerned about claim severity, which was cited by 83 percent of those surveyed. Meanwhile, 67 percent identified type of project (e.g., condominiums, schools, transit, tunnel, water/wastewater) as a top factor for raising a firm’s premium rates, followed by claims frequency (56 percent), and lack of risk management practices and type of discipline (39 percent, each). With respect to their claims experience in 2018, 67 percent reported no change in their overall claim activity compared to prior years; 28 percent reported better claims results and only 6 percent, heightened claims activity. In comparing 2018 claims patterns with those of prior years, 33 percent of the insurers surveyed saw no measurable differences in claims severity, frequency, expense costs, sources of claimants and/or project types causing more claims. Yet, 39 percent reported increased claim expenses, 33 percent, higher claim severity, and 28 percent, increased claim frequency. Furthermore, 17 percent had more claims in 2018 with respect to certain project types, such as residential, traffic, roads and highways. While the majority of insurers (61 percent) didn’t link any specific geographic location to increased claim activity, 39 percent reported more claims in specific regions. Among them, 71 percent had more claims in the Southeast and 29 percent, each, in the Northeast and West Coast. Nearly all of the insurers surveyed (16 of 18) ranked structural engineering – and 13 of 18, geotechnical engineering – among the top three disciplines in terms of significant underwriting risk, followed by architectural, process engineering and land surveying. Similarly, he added that A/E firms need to recognize how underwriters view their project mix. An overwhelming number of insurers (16 of 18) view condominiums as the riskiest projects, followed by other residential projects, bridges and tunnels, large public facilities (such as airports, stadiums and convention centers) and K-12 schools. When asked to rate their level of concern about various risk trends they are monitoring from an underwriting perspective, the insurers surveyed appeared most concerned (72 percent) about judicial rulings eroding protections for design firms under state statutes, such as economic loss doctrine. Other key concerns included: new construction materials/methods (61 percent), public-private partnerships (28 percent), and increase in design-build (22 percent). Meanwhile, the current market conditions are likely to continue to prevail as long as the economy stays strong and overall claim activity remains stable. Notably, 44 percent of the insurers surveyed indicated that external economic conditions might impact rates or limit capacity they are willing to offer. To obtain a complimentary copy of the Ames & Gough Survey, PLI Market 2019: Insurers Achieve Strong Growth Despite Competition and Flat Rates, email info@amesgough.com.